Two F-22 Raptors from the 95th Fighter Squadron, 325th Fighter Wing, Tyndall Air Force Base, Fla., fly in formation and conduct training operations with two Royal Norwegian air force F-35A Lightning II aircraft during an air refueling over Norway, Aug. 15, 2018. The F-22s deployed to Spangdahlem Air Base, Germany, on Aug. 8 and will remain in Europe for several weeks to train and forward deploy to NATO nations. 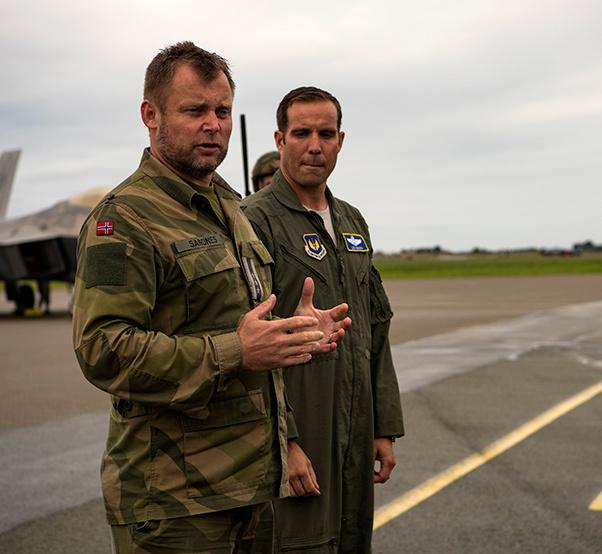 Royal Norwegian air force Col. Hans Ole Sandnes, left, speaks about U.S. and Norway partnership during an F-22 Raptor forward deployment to Orland Air Base, Norway, Aug. 15, 2018. 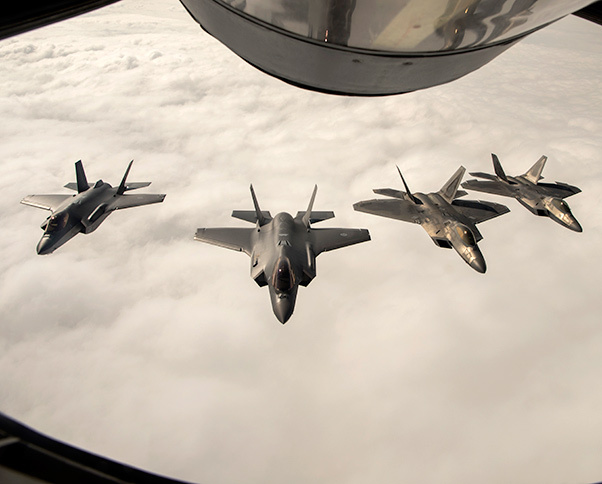 The deployment included F-22s from the 95th Fighter Squadron, 325th Fighter Wing, at Tyndall Air Force Base, Fla., practicing in-air refueling and training with Royal Norwegian F-35A Lightning II aircraft. 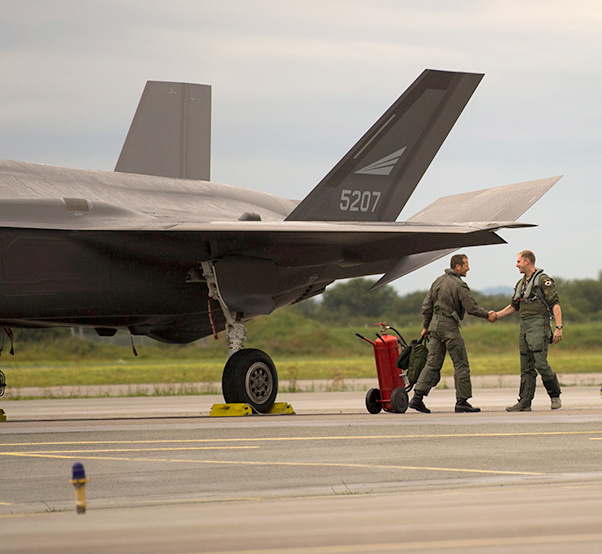 A U.S. Air Force F-22 Raptor pilot from the 95th Fighter Squadron, 325th Fighter Wing, Tyndall Air Force Base, Fla., meets with a Royal Norwegian air force F-35A Lightning II pilot during an F-22 forward deployment at Orland Air Base, Norway, Aug. 15, 2018. The F-22s are deploying from Spangdahlem Air Base, Germany to operating locations within other NATO member nations to maximize training opportunities while strengthening the NATO alliance and deterring regional aggression. 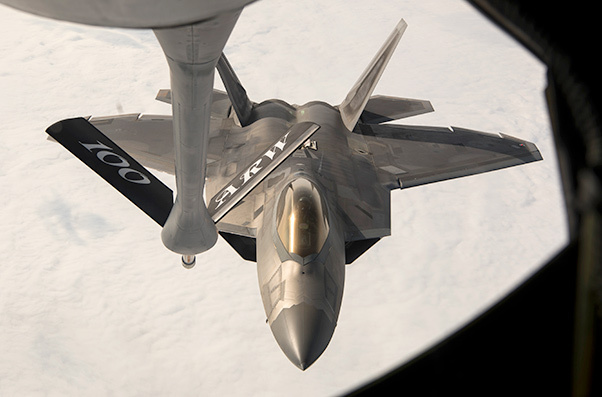 A U.S. Air Force F-22 Raptor from the 95th Fighter Squadron, 325th Fighter Wing, Tyndall Air Force Base, Fla., receives fuel from a U.S Air Force Boeing KC-135 Stratotanker assigned to the 100th Air Refueling Wing, Royal Air Force Mildenhall, England, above Norway, Aug. 15, 2018. The F-22s practiced refueling and trained with Royal Norwegian air force F-35A Lightning II aircraft during a forward deployment to Orland Air Base, Norway. 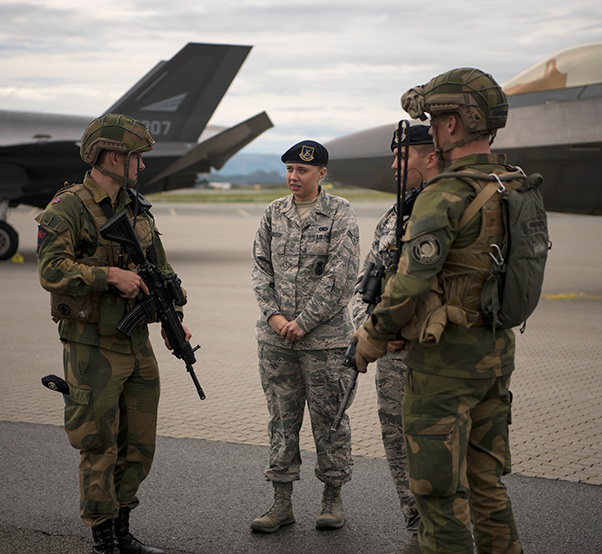 U.S. Airmen from the 325th Security Forces Squadron, 325th Fighter Wing, Tyndall Air Force Base, Fla., talk to Royal Norwegian air force base defense members during an F-22 forward deployment to Orland Air Base, Norway, Aug. 15, 2018. The F-22s from the 95th Fighter Squadron, 325th FW, at Tyndall AFB, Fla. trained with Royal Norwegian F-35A II Lightning aircraft as part of a forward deployment from Spangdahlem Air Base, Germany.